Over the years McKevitt Trucking has developed valued relationships with each of their customers. Our strength is to understand each of their needs, and give a personalized service to meet every commitment. McKevitt offers service into the U.S. from our terminal points in Thunder Bay, Sault Ste. 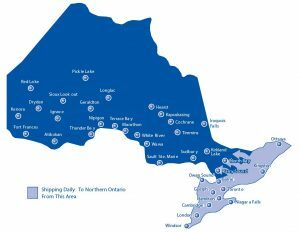 Marie, Mississauga, Sudbury, Timmins and North Bay as well as service from the US into Manitoba, Ontario and Quebec. 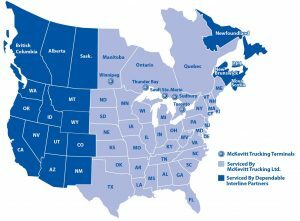 For almost 70 years, Mckevitt Trucking has grown into a complete, shipping and logistics firm, able to provide a wide range of services to a wide geographical area. Family owned and operated since 1948 our family worked their way from a one truck operation, to one of the largest Canada/USA carriers in Northern Ontario. In 2018 we will be celebrating 70 years in business, as we continue to offer unparalleled service, while employing some of the best drivers and staff in the industry. We at McKevitt Trucking Limited would like to encourage new and experienced drives to come drive with us. McKevitt Trucking is more than just a transport company, we offer you a business partnership that extends well beyond any service contract. The founders of McKevitt Trucking have almost 70 years of experience in the trucking industry. McKevitt is also a dynamic and professional team comprised of over 300 experienced employees. 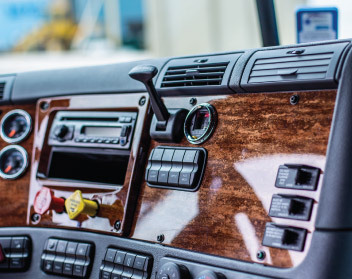 We at McKevitt Trucking Limited would like to encourage new AZ drivers coming into the industry, and give them a chance to start their career with our company. We offer cutting edge training programs to launch you into your new career.